But this kind of compact living is on the rise. As migration to urban areas continues at a growing pace increasing the demands on housing and resources. There is also an increase in the number of people living alone in cities, 50% of New Yorkers live alone and in London, the figure is 43%. In the States, demand for affordable, convenient housing in desirable areas has given rise to micro-apartments across the country. Footprint, a company in the US offer micro-housing for those looking for an affordable home in a great location. All of their buildings are located in urban neighbourhoods, within walking distance of transit hubs, shopping, work and schools. One of the biggest problems with living in a small space is inadequate storage and in particular where to put laundry baskets ironing boards and of course where to hang the laundry. We had a client who had a 1 bedroomed apartment with no storage other than her wardrobes and a tiny hot-press off the hall. Her kitchen layout was so poor that she had to use her ironing board as extra layout space while cooking and her drying rack was a permanent feature in the living room. The kitchen was a u-shaped layout which opened onto the living space. 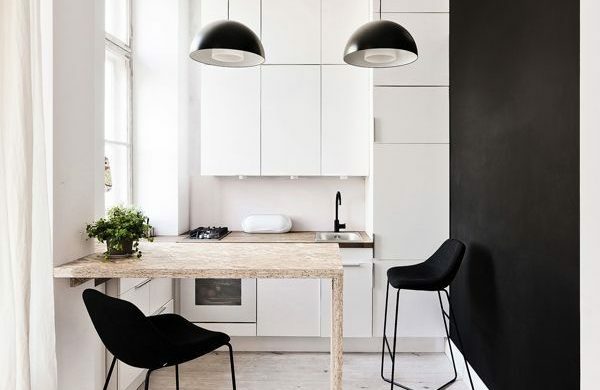 This kind of layout is really inefficient as there are 2 corners, the cupboards are difficult to access and the countertop is not really usable. As the kitchen backed onto the hot-press we decided to reconfigure both spaces together layout to make a small utility cupboard where we could stack a washer and dryer and provide some space for drying clothes. We then reconfigured the kitchen layout to maximise storage whilst providing as much usable counter space as possible. The simple addition of a utility space freed up the living space and also created more space in the kitchen by taking the washer and dryer out. 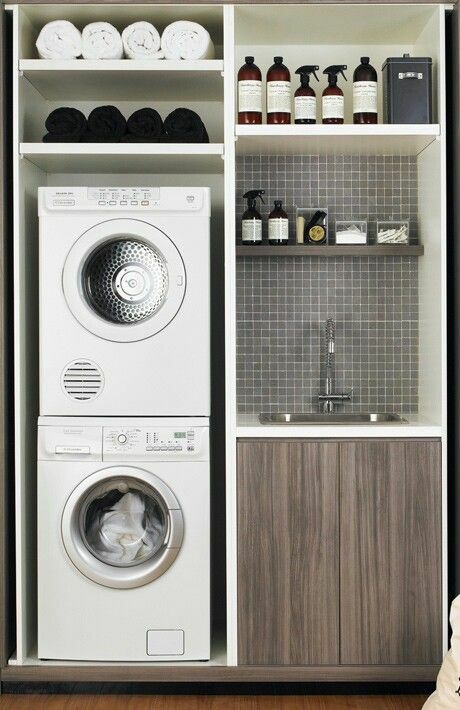 If you don’t have the budget to reconfigure your space or are renting another solution is to purchase a free-standing storage unit where you could keep laundry baskets – install a hanging rail to let you hang clothes to dry and some shelves for additional storage. With smaller living spaces your choice of furniture is really important. Opt for benches rather than chairs for dining tables which can be pushed under the table out of the way. Choose furniture that has a dual purpose, such as a sofa-bed for overnight guests or beds with under-mattress storage – which is particularly useful for storing bulky bed linen and heavy blankets. Mirrors are another great idea. And these are one item of furniture where you can think big even in the smallest of spaces. 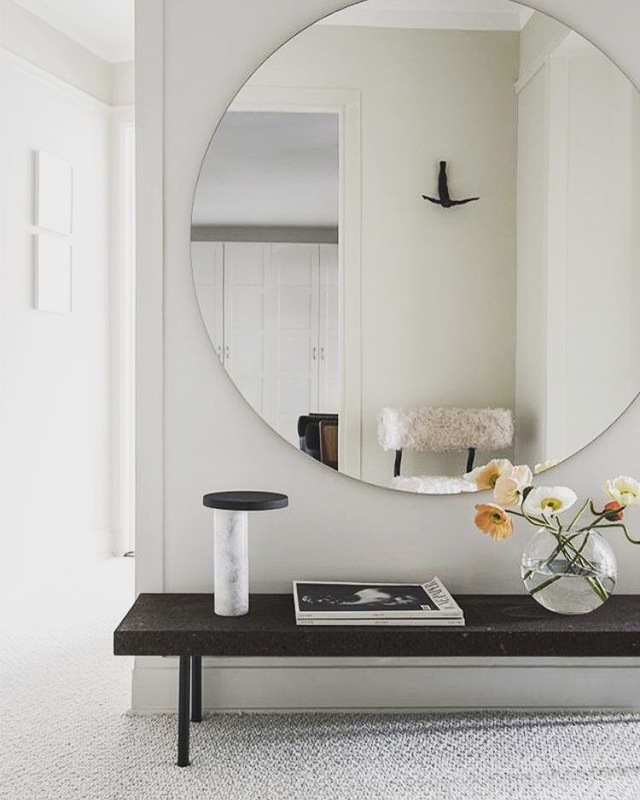 Oversized mirrors are a great investment, propped up against one wall of the living area they can have the effect of doubling the room in size as well as looking great.